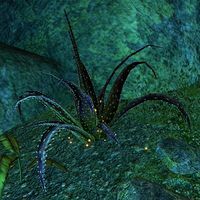 The Xal-Vakka Aloe is a variety of Aloe plant that grows within the caverns beneath the Vakka-Bok Xanmeer. They were discovered to have powerful healing abilities. Xthari is an orange flower that grows in Black Marsh. The leaves are extremely poisonous, but the petals, which are coated in a greasy substance, act as a powerful curative. The downside to using these petals in an antidote to poison is that the recovery will be very painful. When added to the proper reagents, the petals turn the mixture pink. ^ Tuwul's dialogue during Aloe That Heals in Murkmire. ^ Gordag's Journal from Atanaz in Shadowfen. This page was last modified on 9 March 2019, at 21:41.